Update 2/10: TechCrunch is once again available in China. We are standing down our forces and resuming commercial activity. 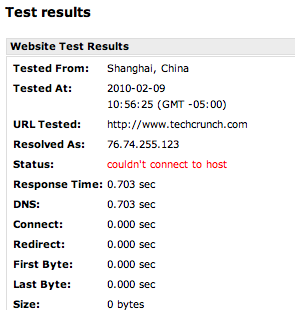 Over the past 48 hours, and perhaps longer, it appears that TechCrunch is being blocked inside China. We’ve confirmed this with contacts and tipsters inside China who can no longer access our site, as well as through Web tools such as WebsitePulse and Just Ping which pings sites from inside China’s Great Firewall. Both of those services indicate that, at least in Shanghai, readers cannot connect to TechCrunch. Chinese readers have reported problems accessing the site in the past as well. If you are located in China and you can read this, please let us know in comments. We are not really sure why we are being blocked. Recently, we’ve covered Google’s decision to to perhaps stop doing business in China following a cyberattack on its servers in the country, but we don’t think that is it. Another possibility, which borders on the absurd, is that on Friday Michael put up a humorous post comparing a Google employee who stopped his SUV because he was talking on his cell phone to the Tank Man who famously blocked Chinese tanks at Tiananmen Square. The title of the post: “A Googler Has His Tiananmen Square Moment.” He followed up with another light weekend post, featuring pictures of him and Robert Scoble re-enacting the incident. That post also had the word “Tiananmen” in the title. They were just goofing off, but perhaps the Chinese government didn’t think it was funny. China still has a policy of wiping out all references on the Web to the Tank Man and the Tiananmen uprising of two decades ago. 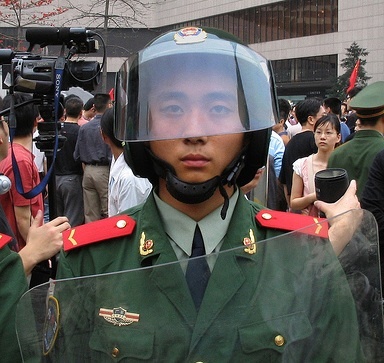 China blocked Twitter on the 20th anniversary of Tiananmen last summer, and has blocked Facebook, Bing and other sites during times of unrest. Our post hardly compares. Again, to be clear, this is all speculation on our part. We don’t know exactly why we are being blocked. There are so many ways we could have offended officials in China. If a Chinese censor is reading this (and we know you are) please let us know what we did via comments or an email.